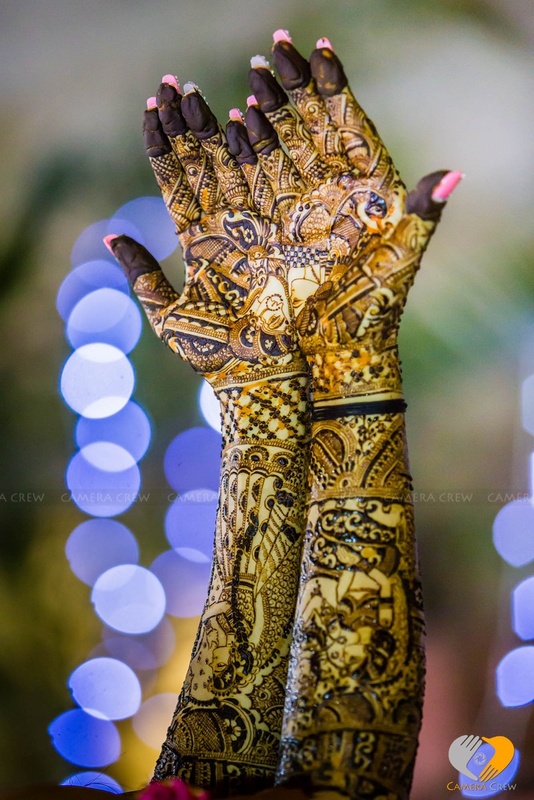 Ever seen a paithani with beadwork? 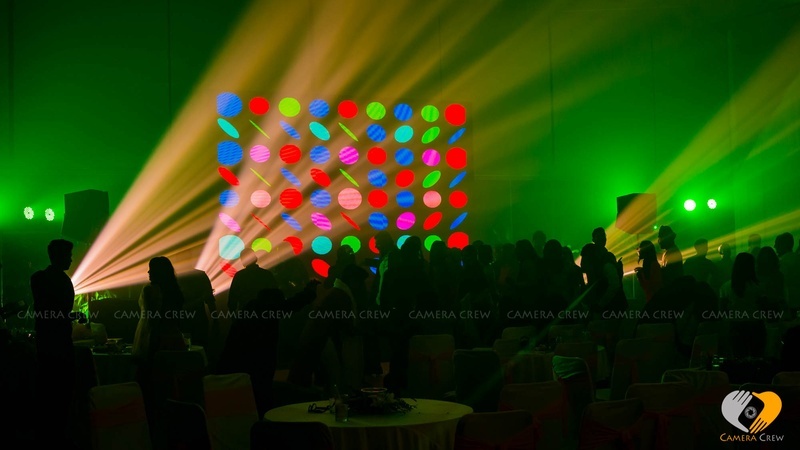 Sounds so alien, but looks so, so gorgeous! 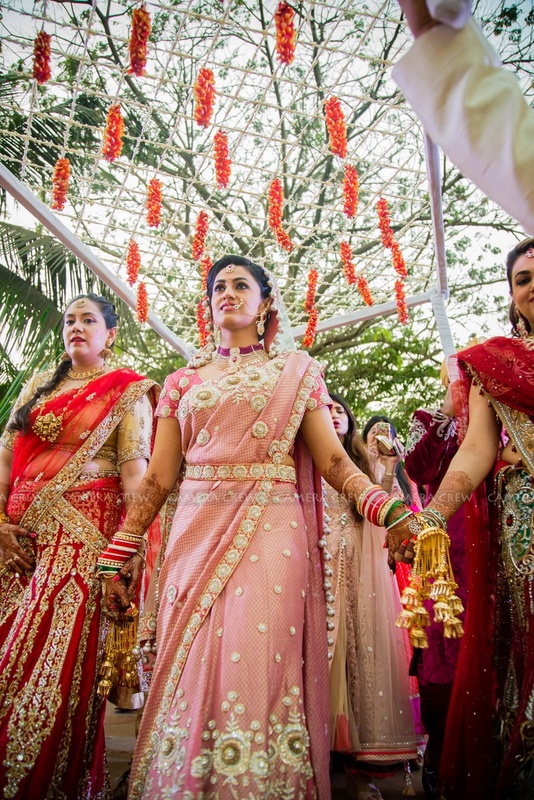 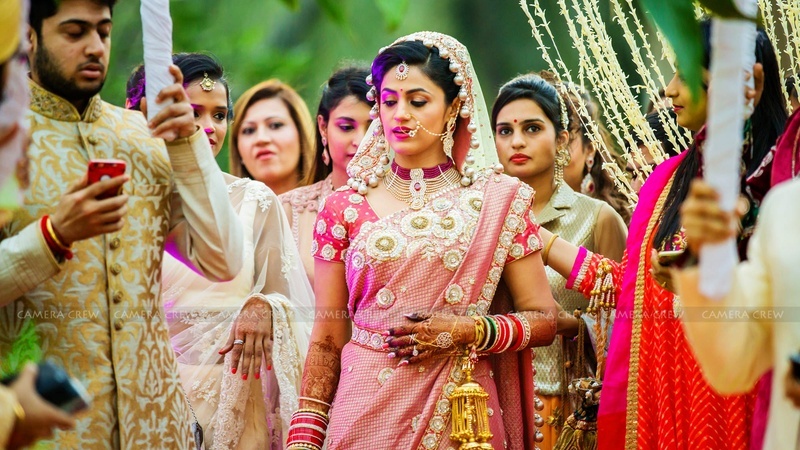 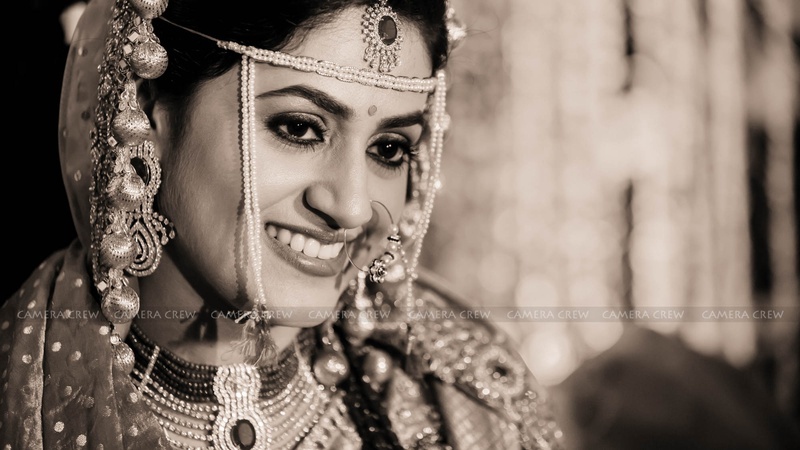 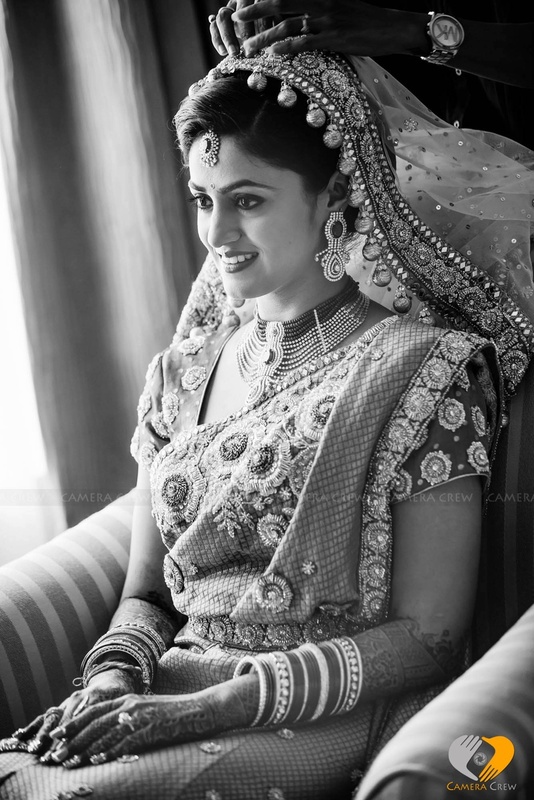 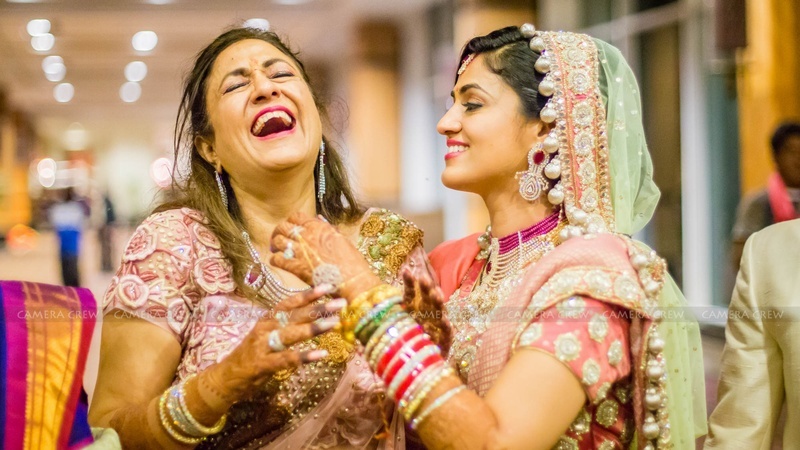 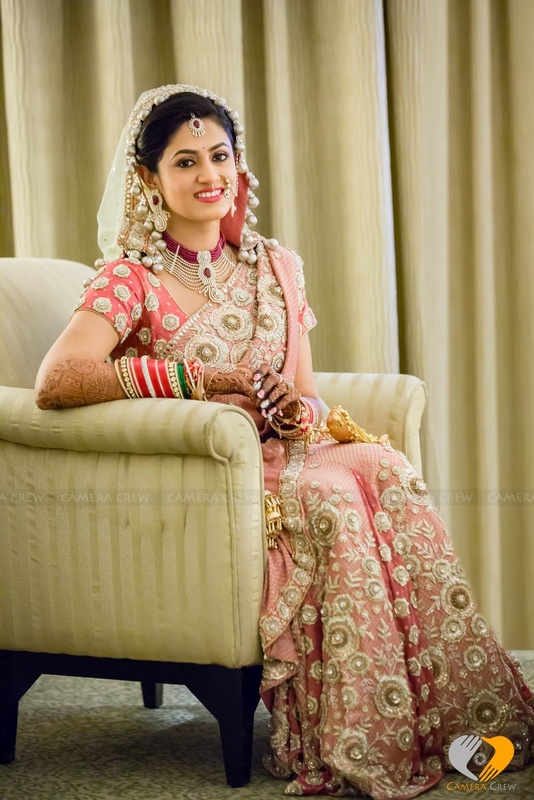 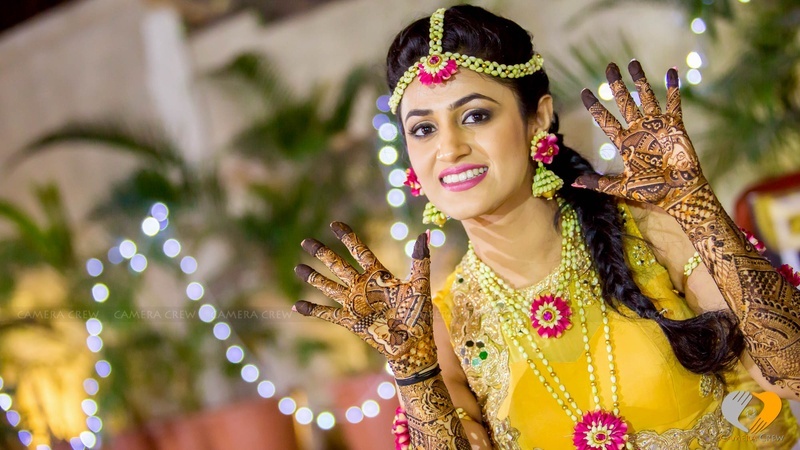 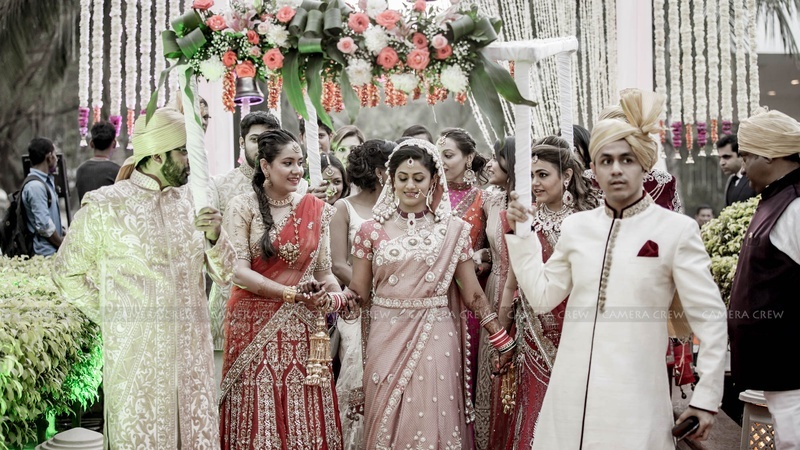 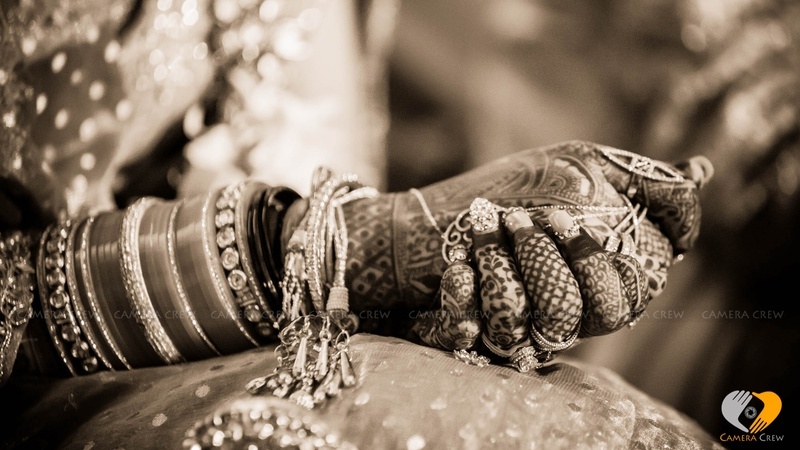 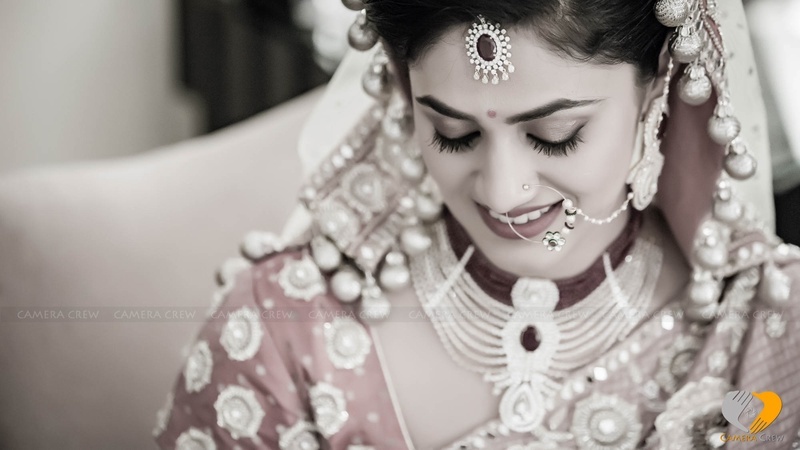 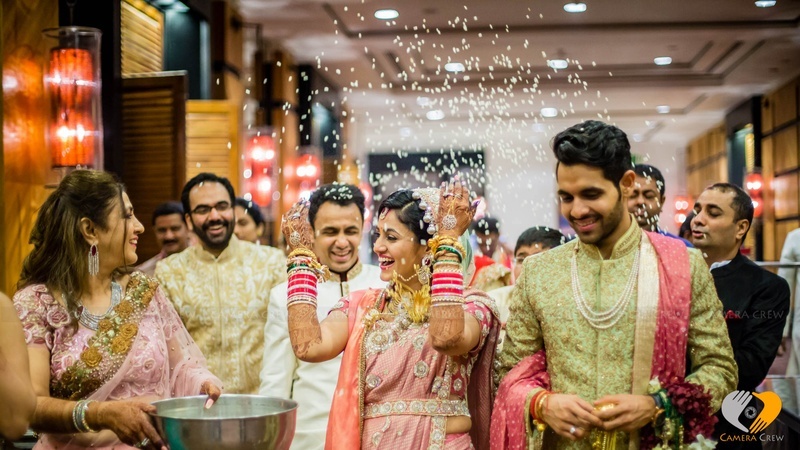 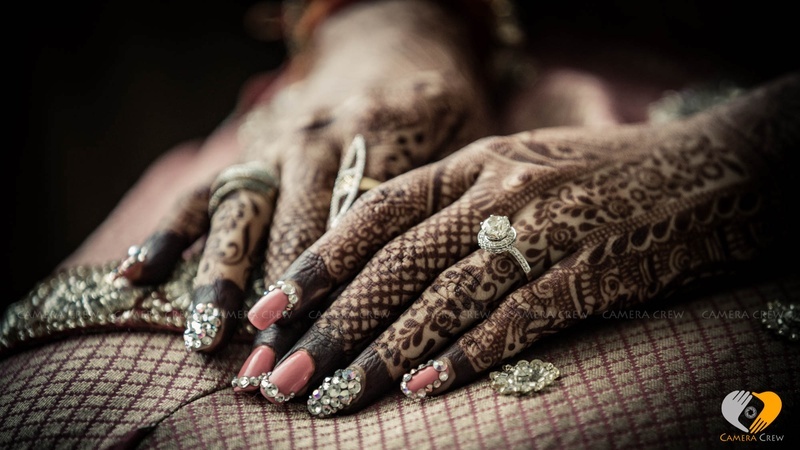 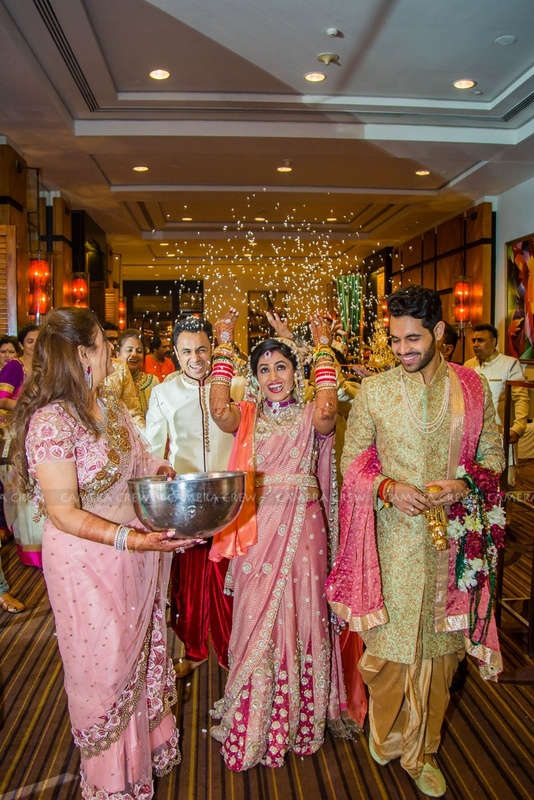 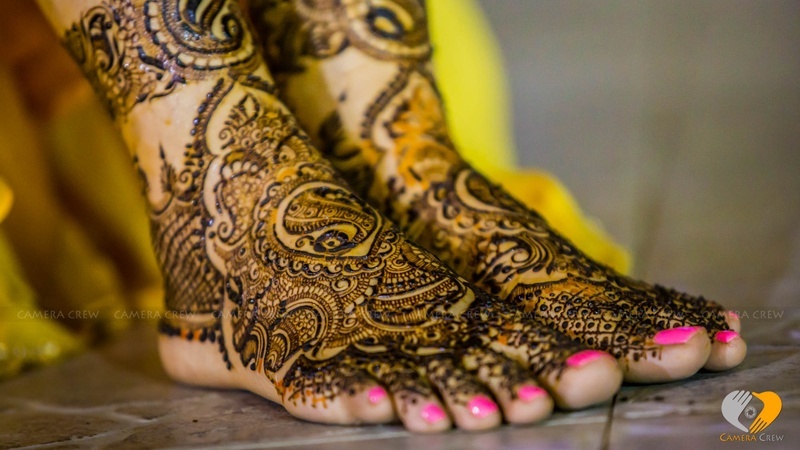 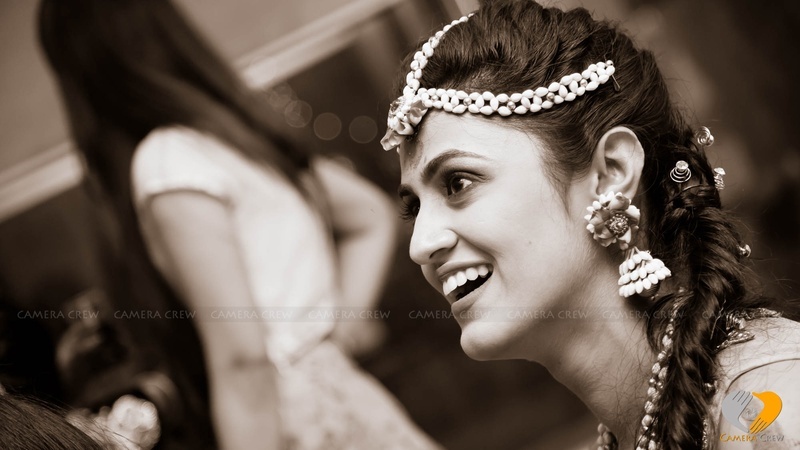 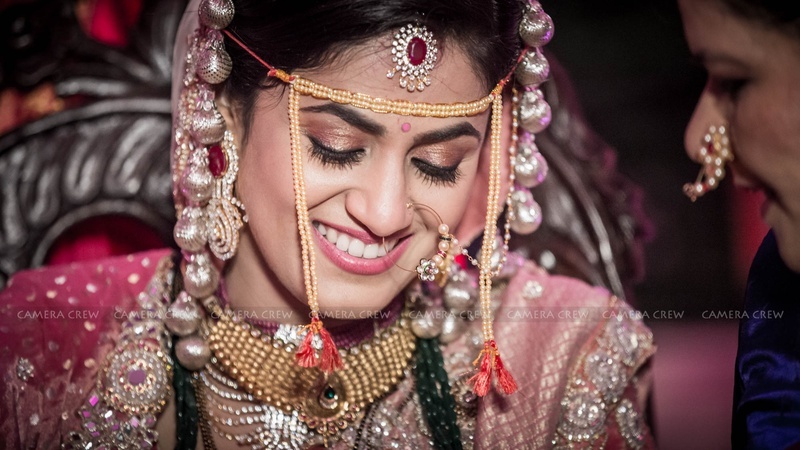 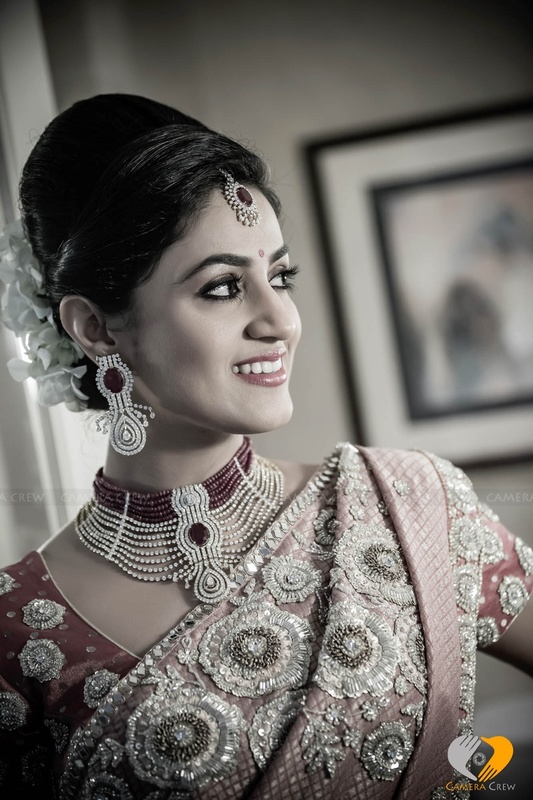 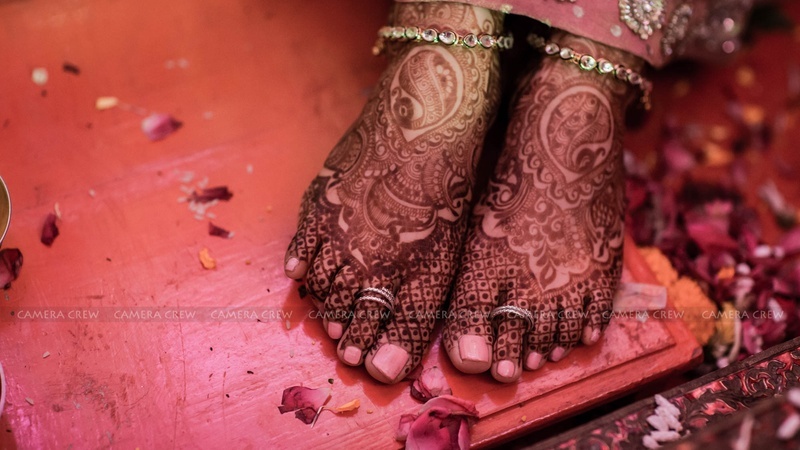 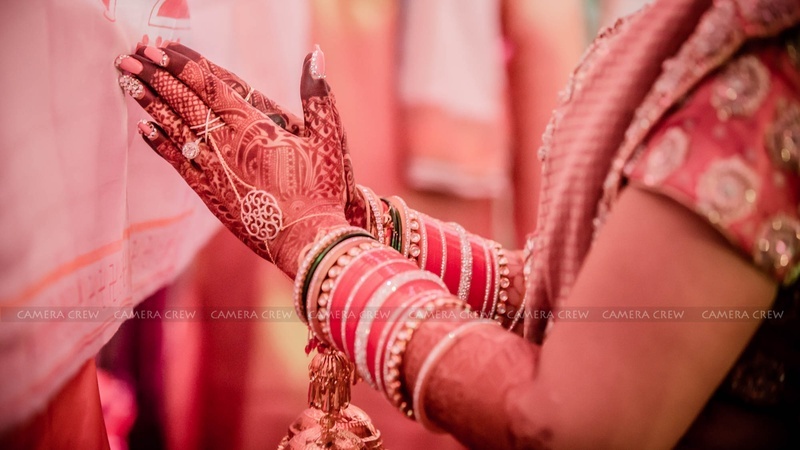 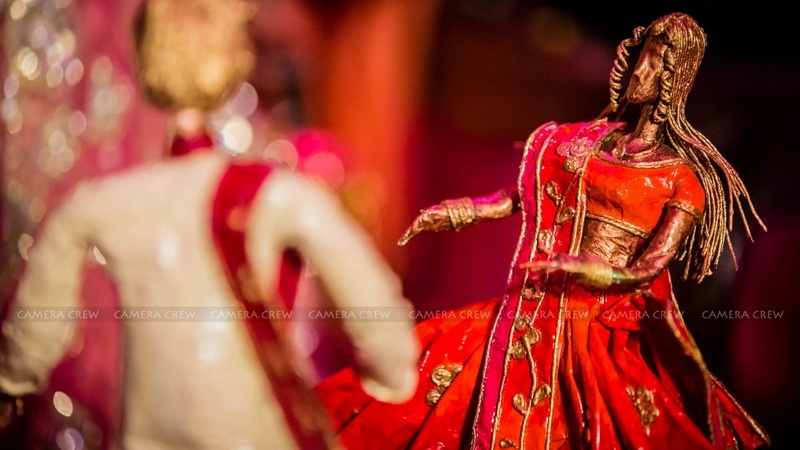 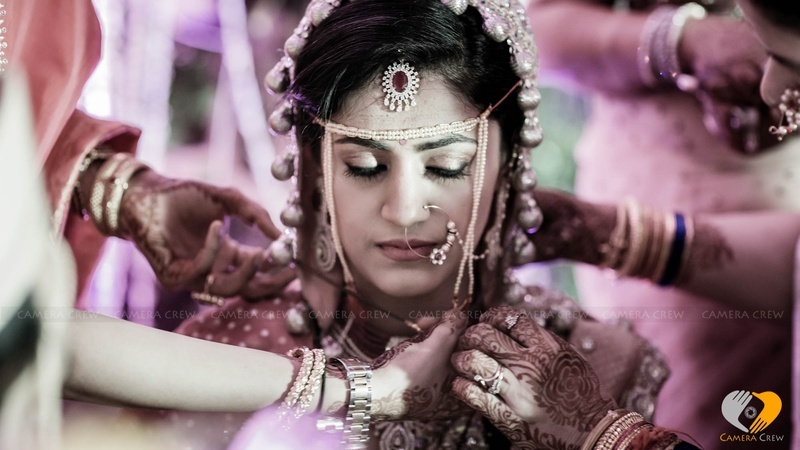 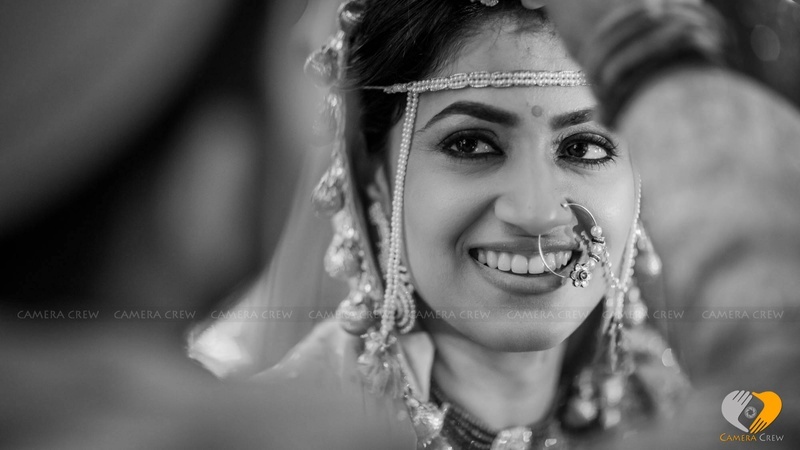 This bride not only wore this stunning saree, but pulled it off flawlessly. 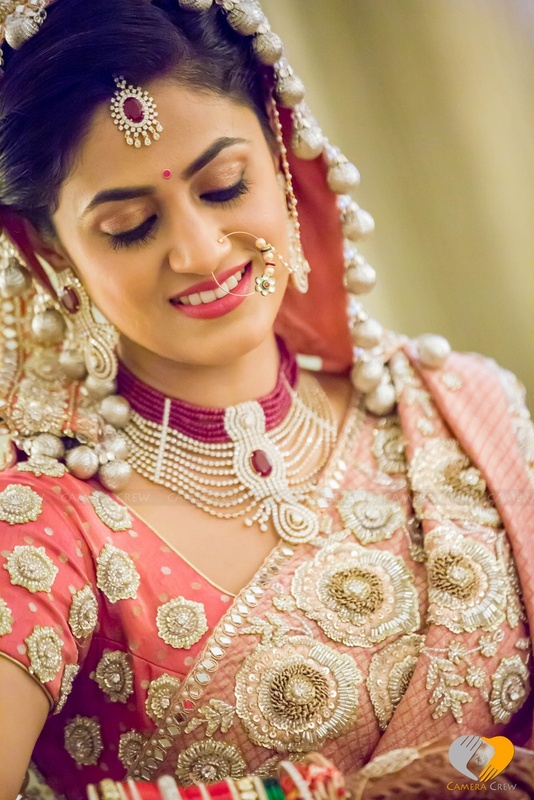 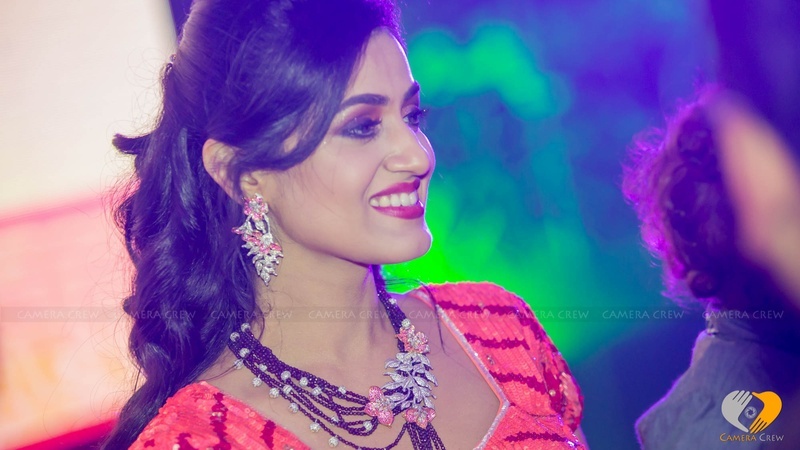 Just like this beadworked paithani, each component at Nishant and Shraddha’s wedding was done with taste, style and a touch of the extraordinary. 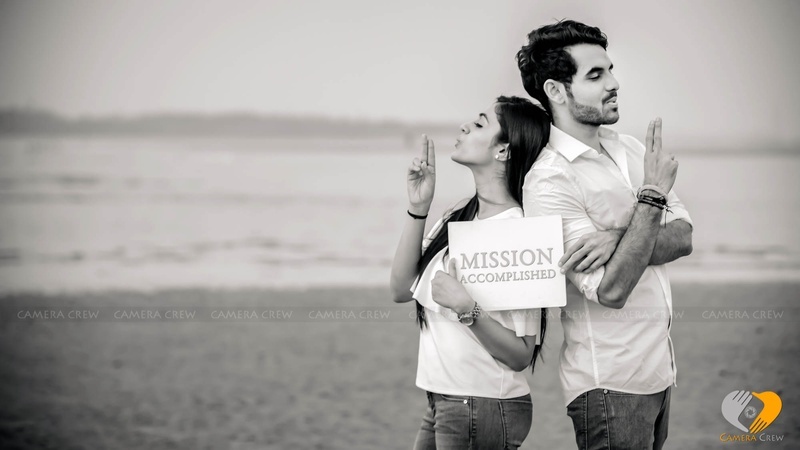 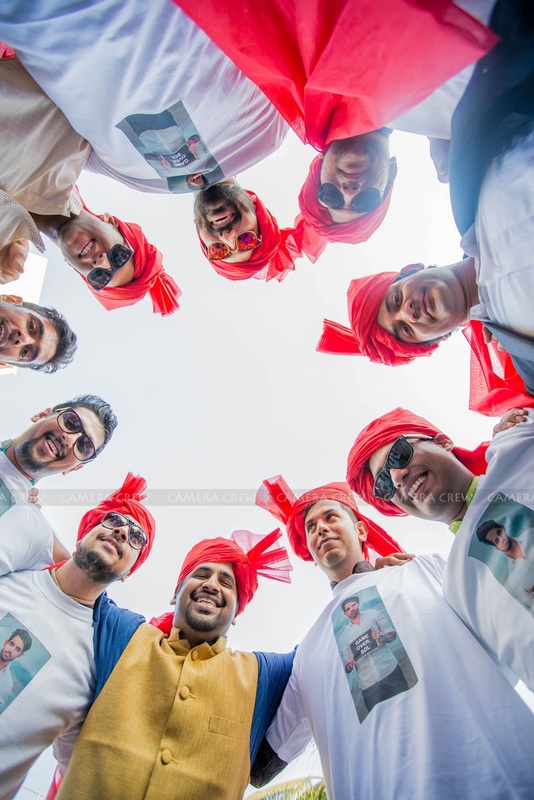 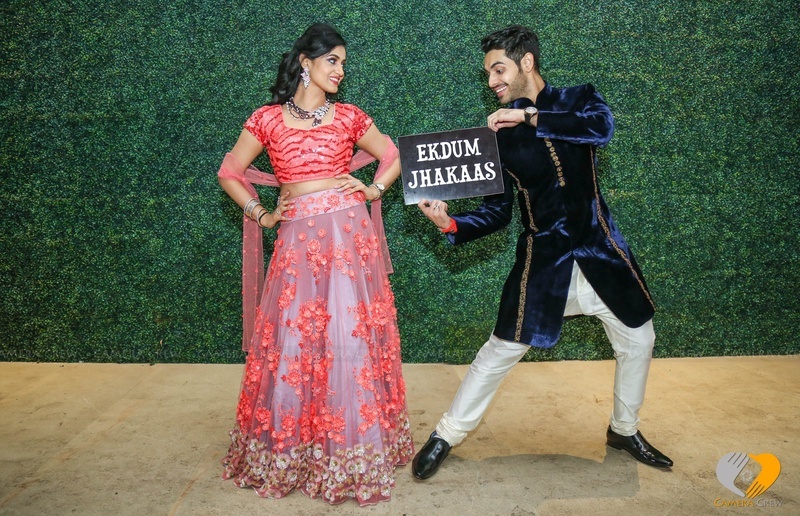 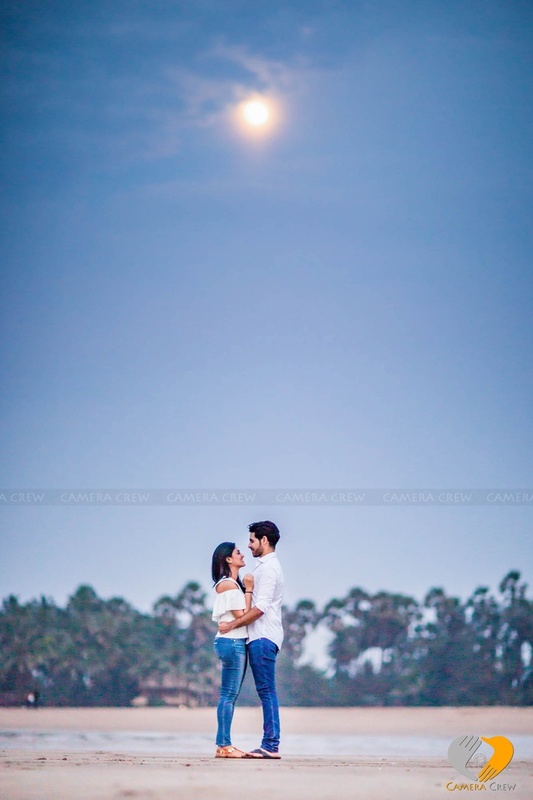 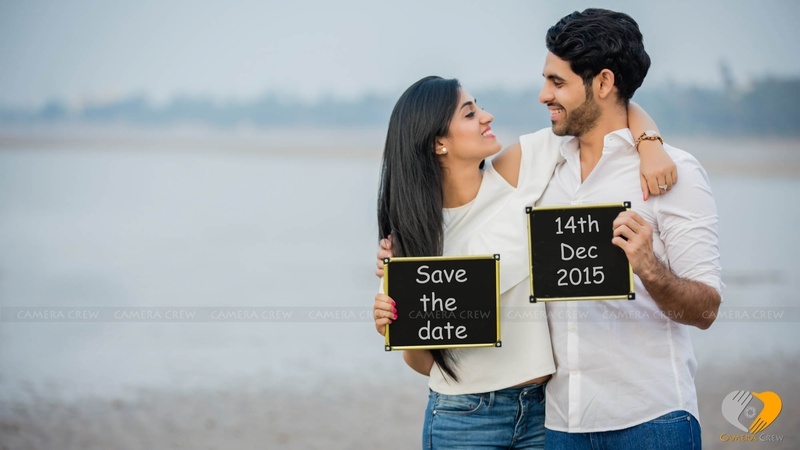 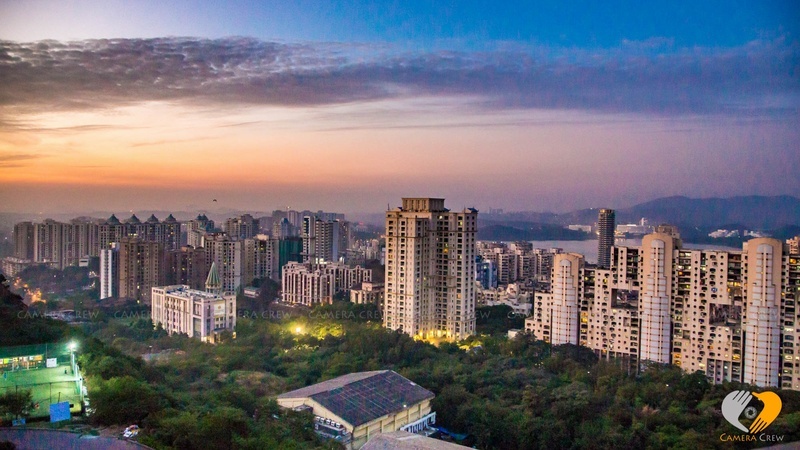 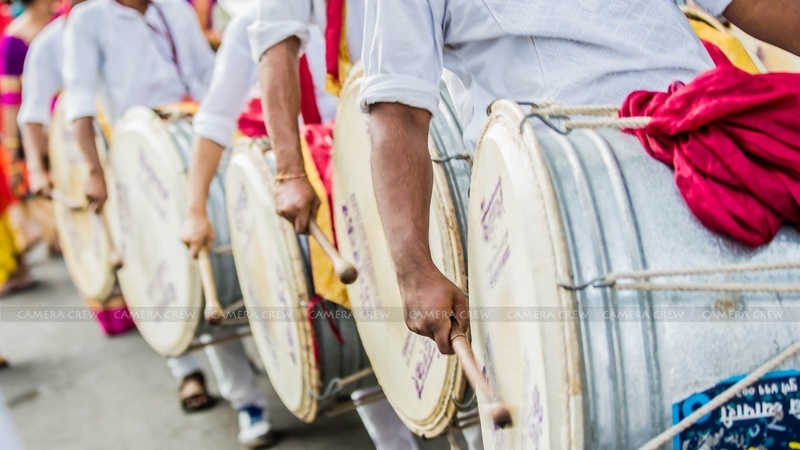 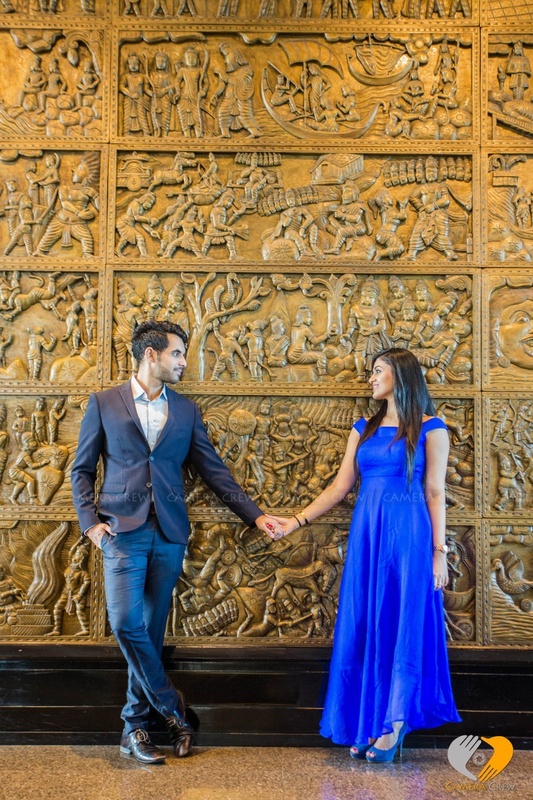 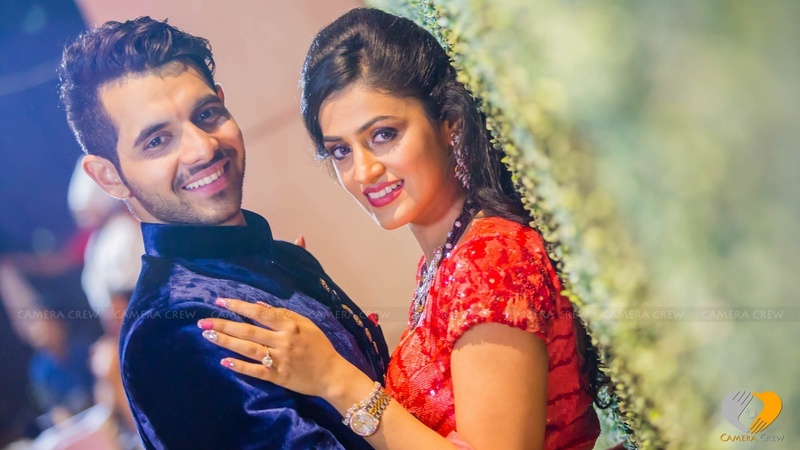 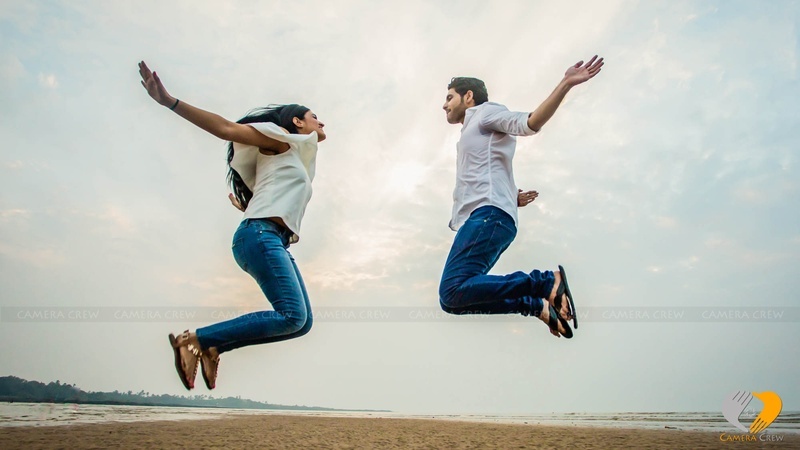 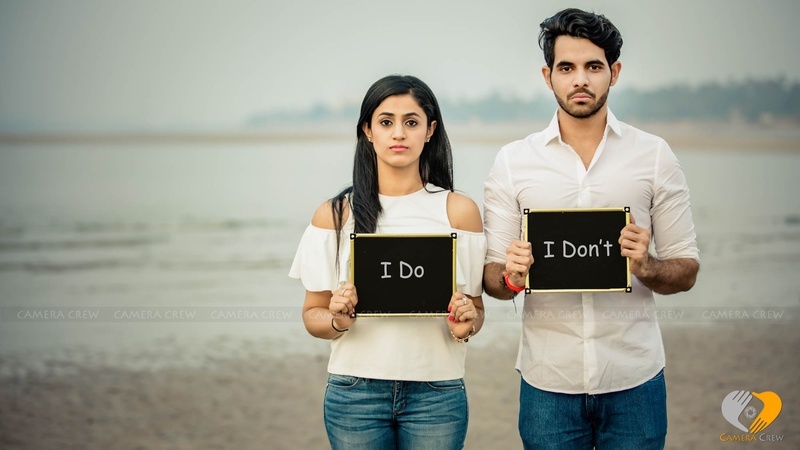 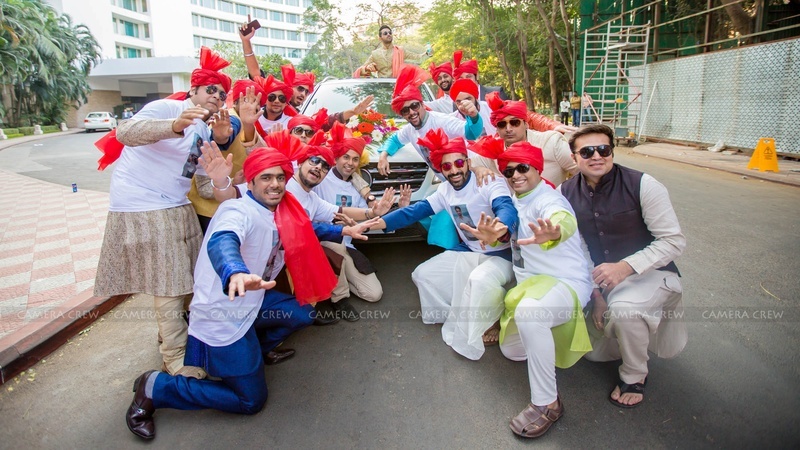 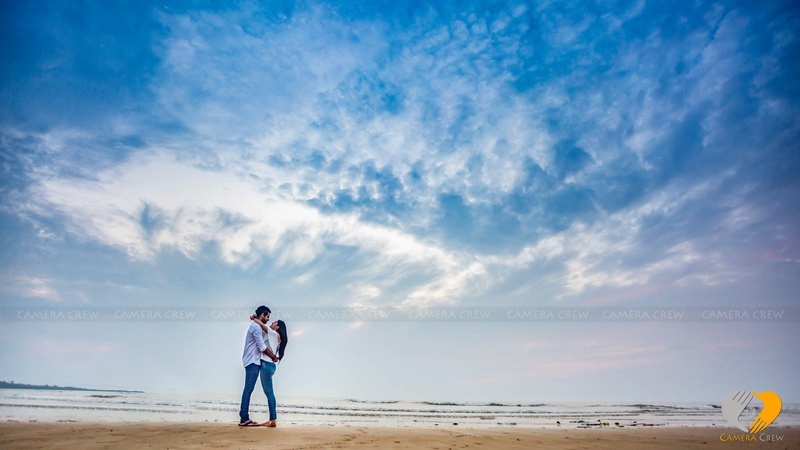 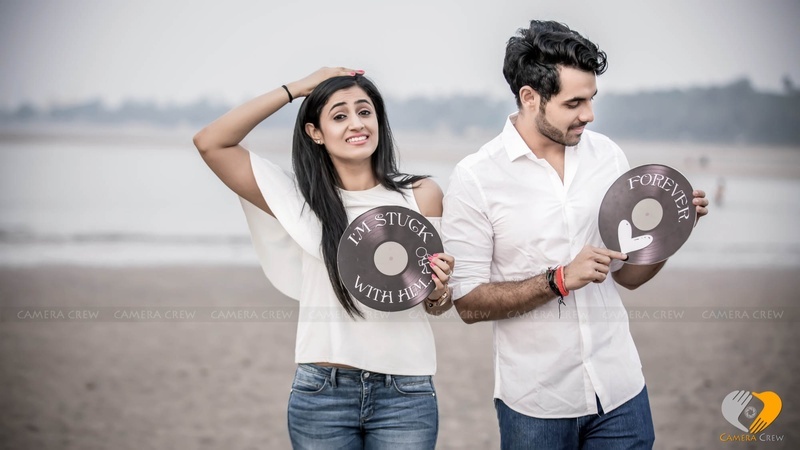 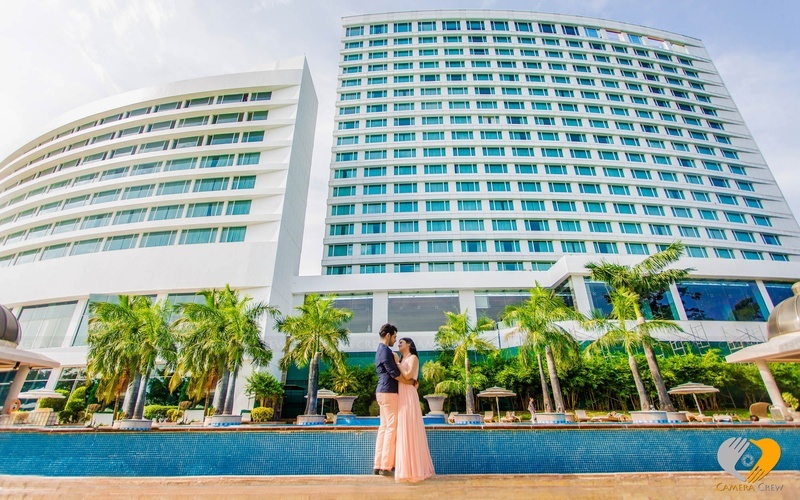 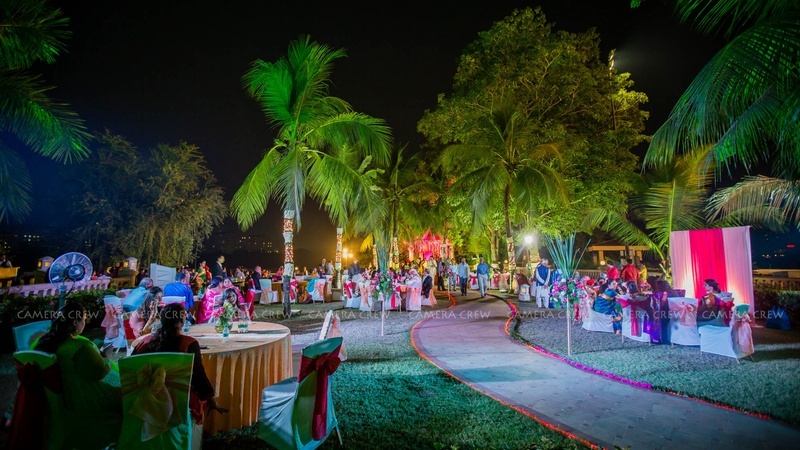 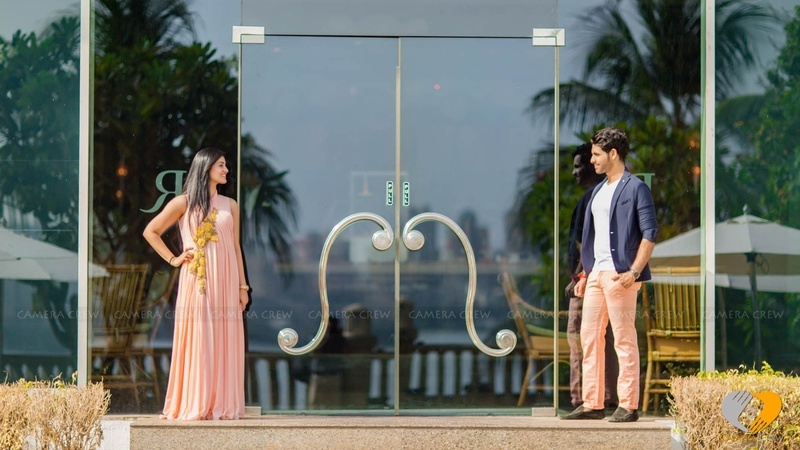 Shot brilliantly by the team at Camera Crew, who used the cityscape of Mumbai to its full potential by capturing stunning pre-wedding photos at Powai lake, which were all kinds of uptown class-filled. 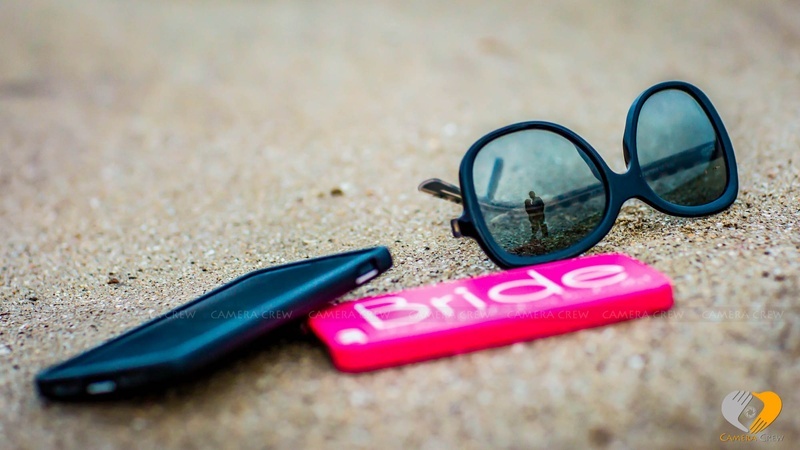 Next came the crazy bit at the beach! 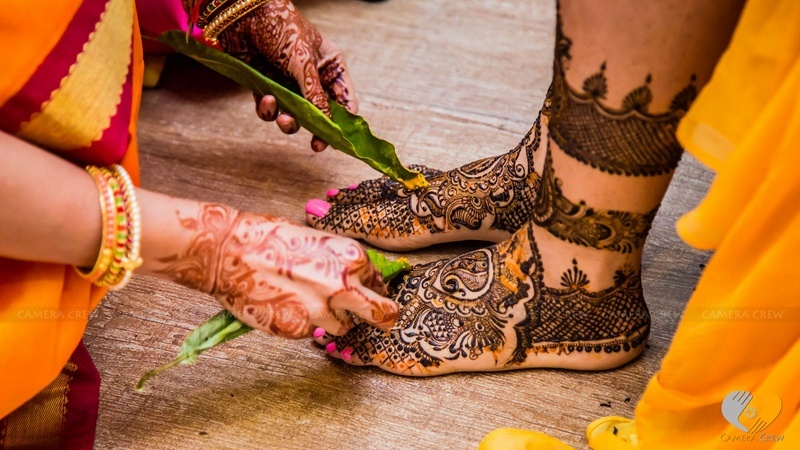 Kung-fu kicks and cute signage’s made their shoot truly pintrest worthy. 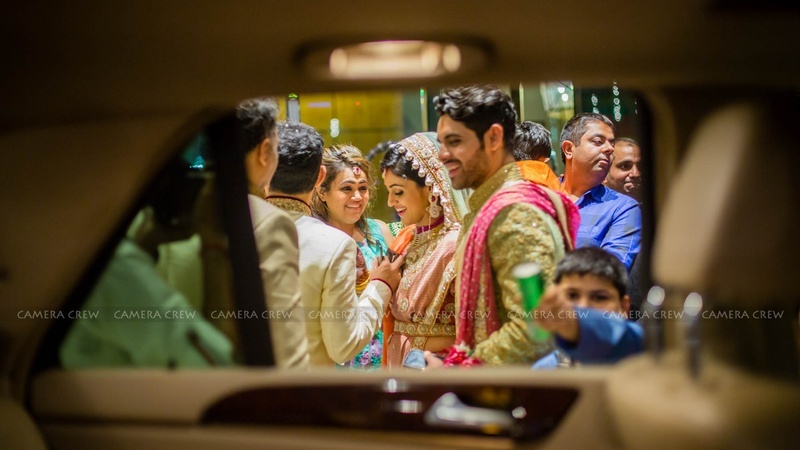 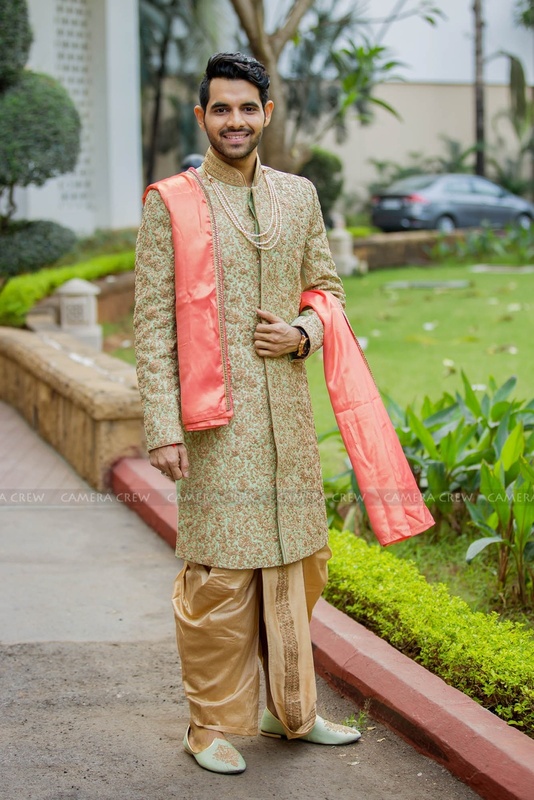 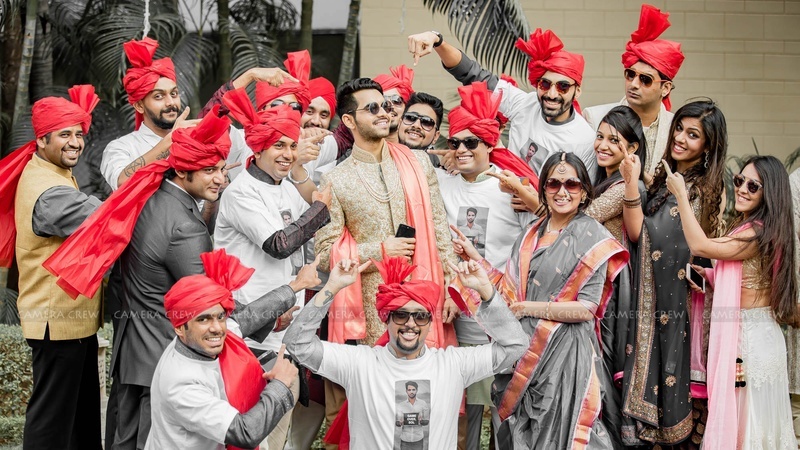 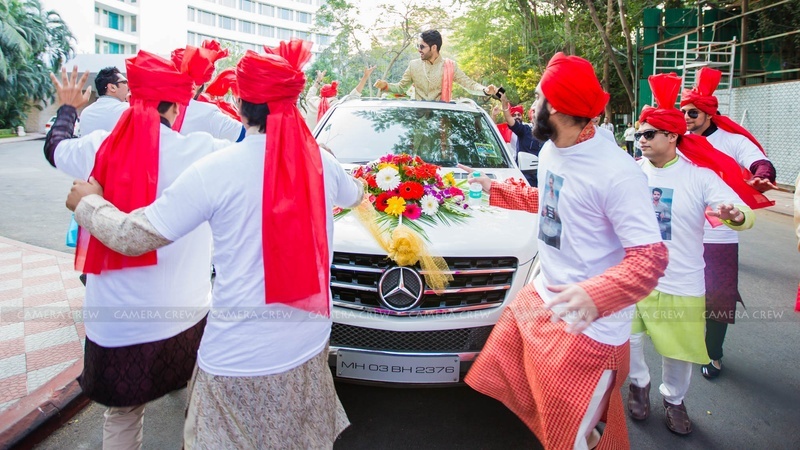 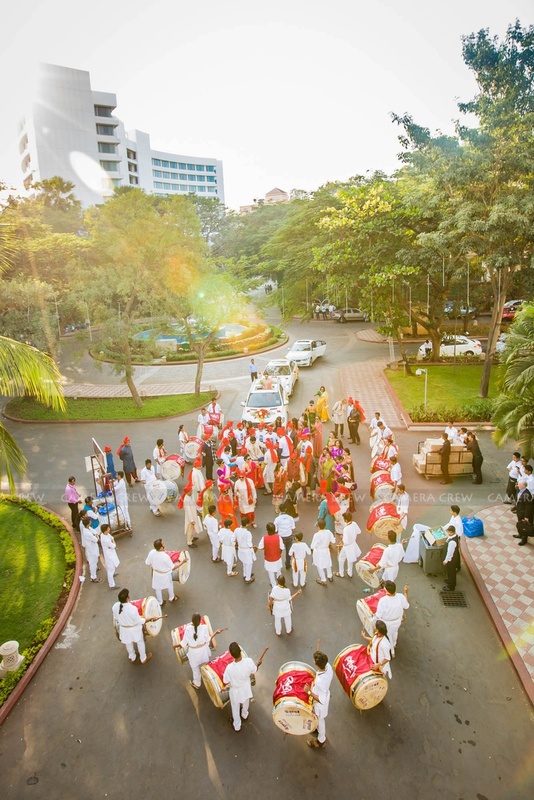 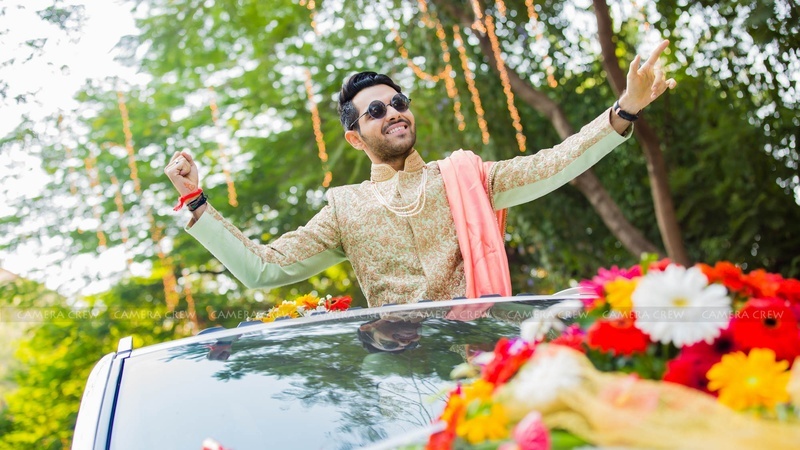 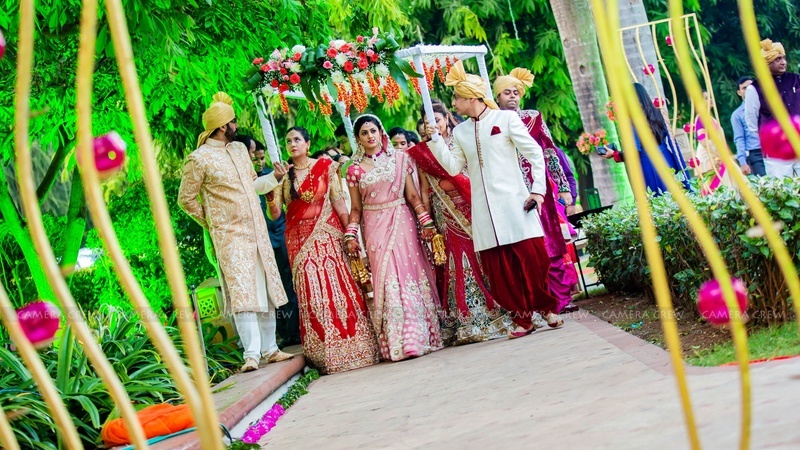 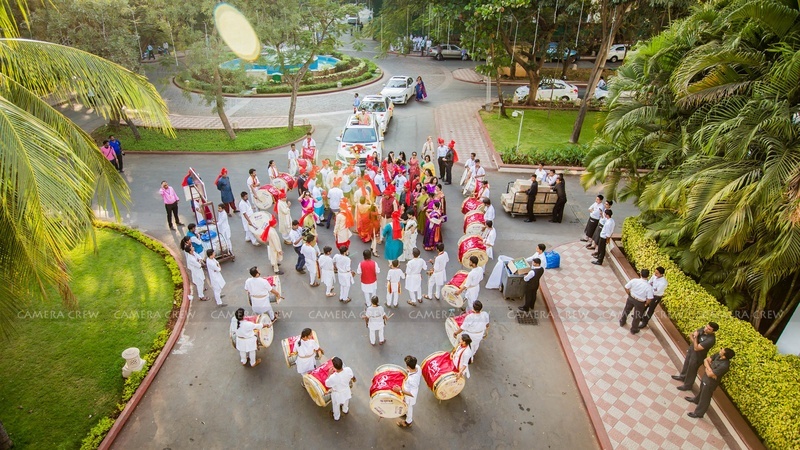 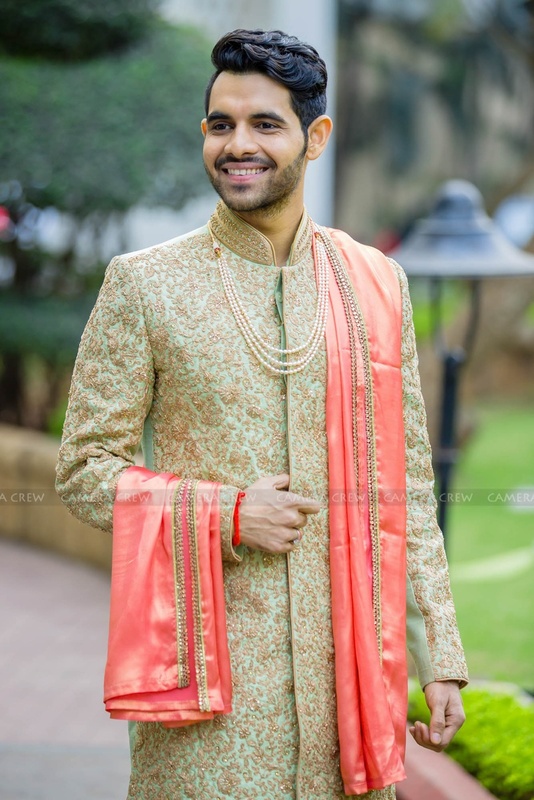 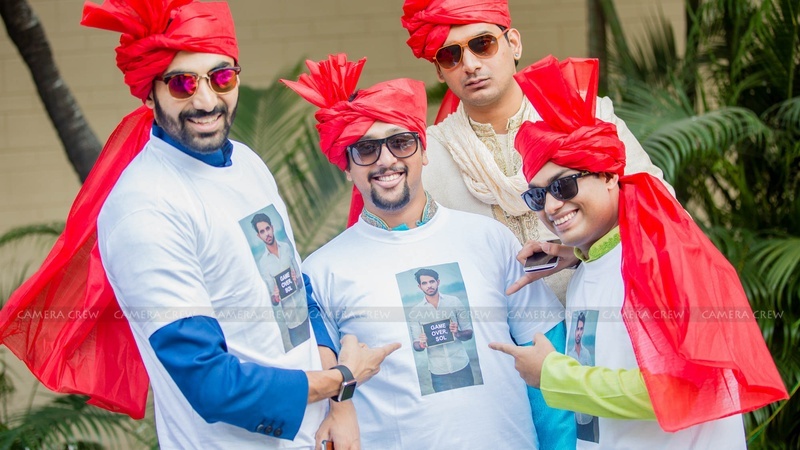 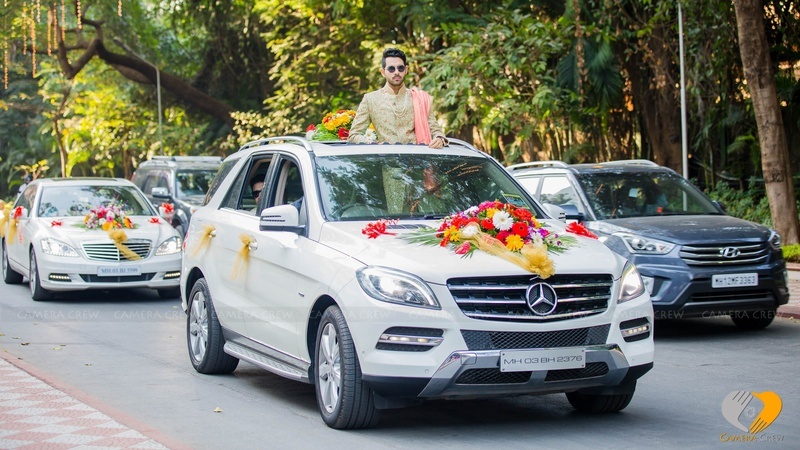 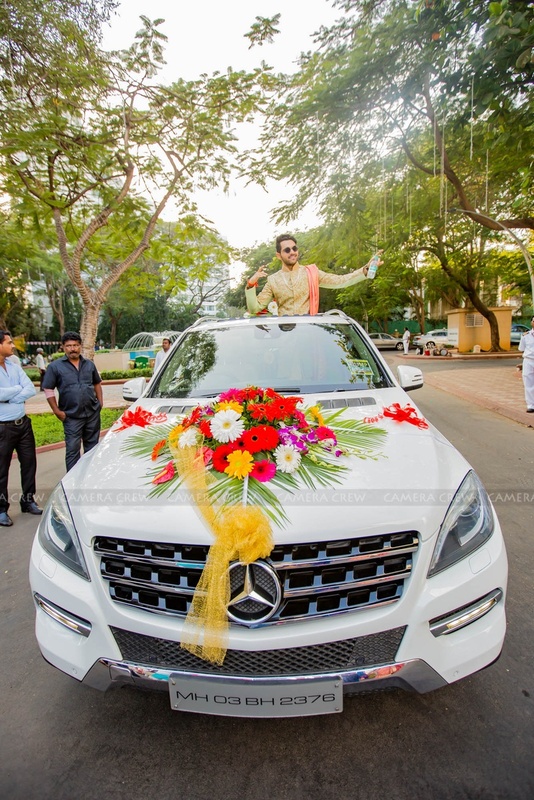 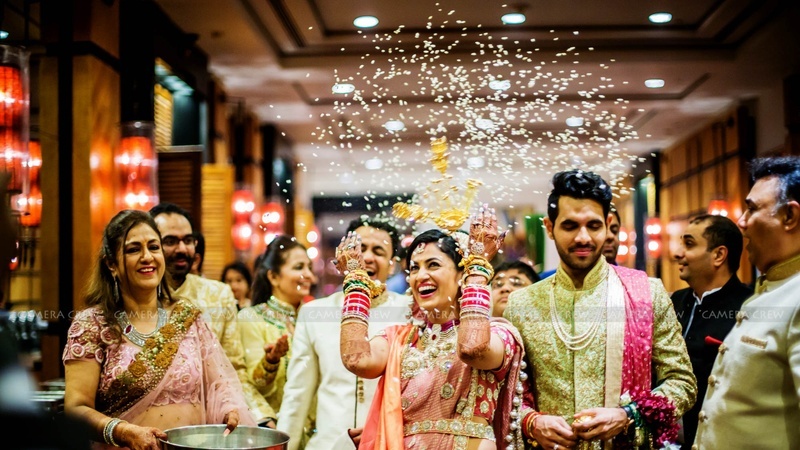 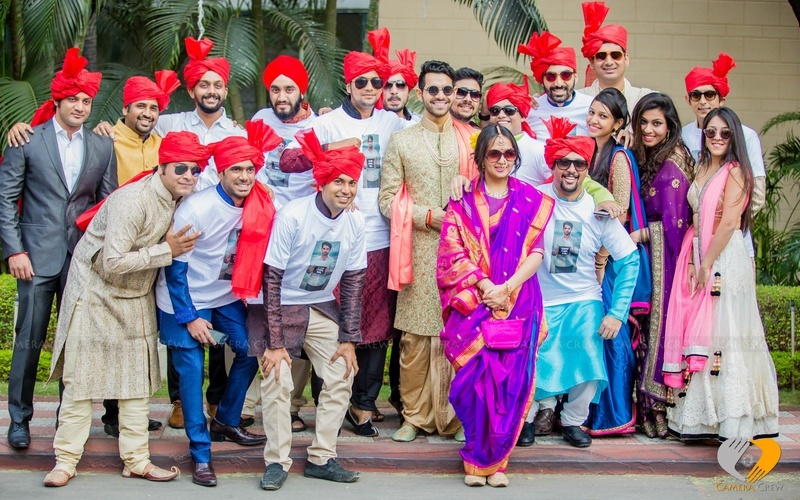 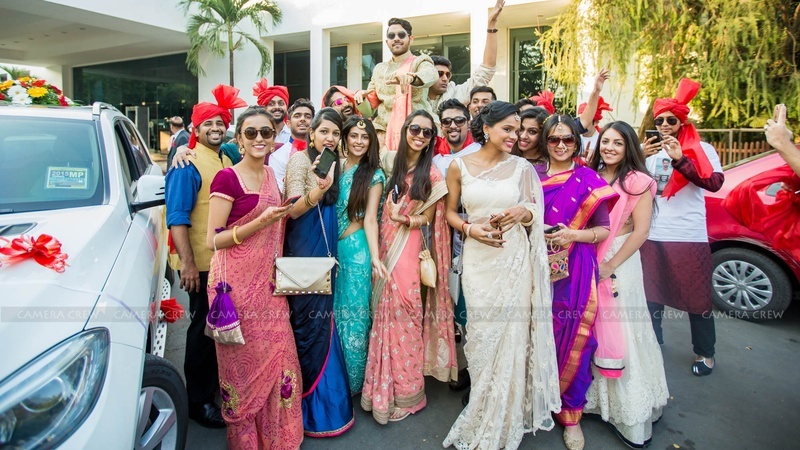 Their wedding was held at Hotel Renaissance, Powai, where Nishant brought on his dapper best in a pastel green sherwani embellished with resham gold embroidery paired with an orange kinnari adorned dupatta and gold dhoti – lovin’ the shift from the usual off-white sherwani to this unusual pastel green. 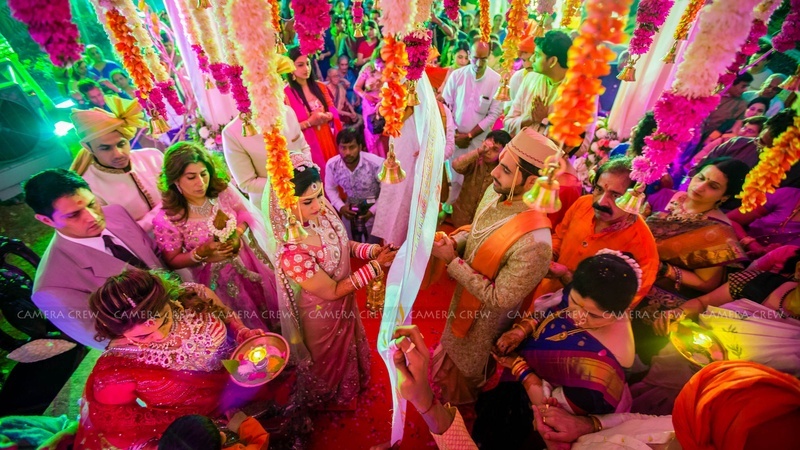 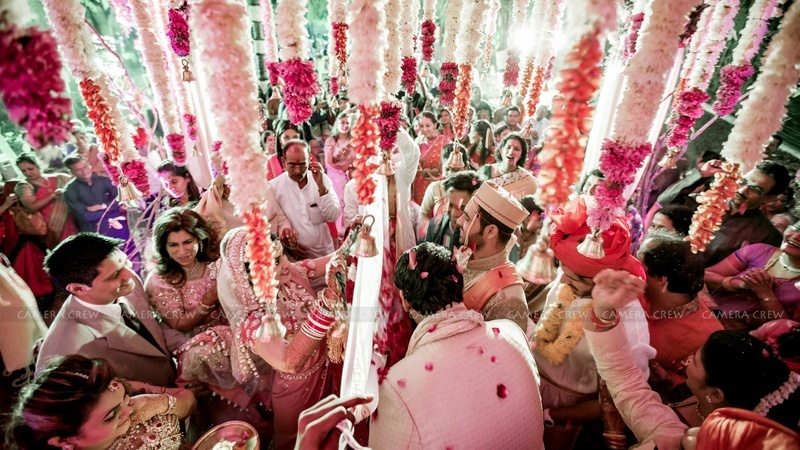 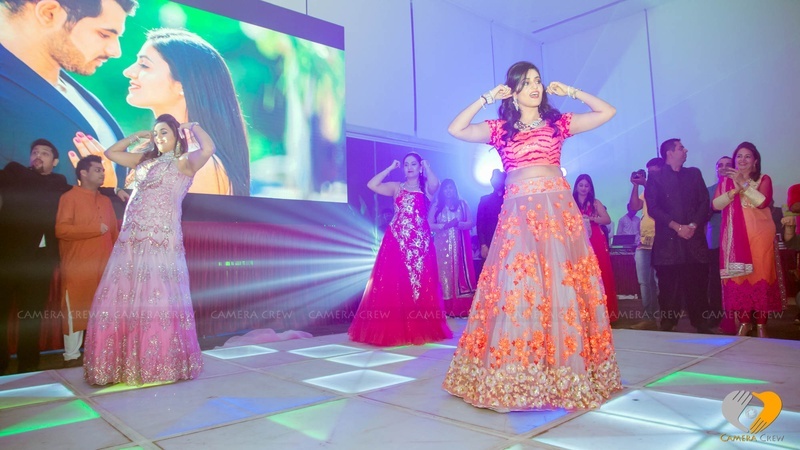 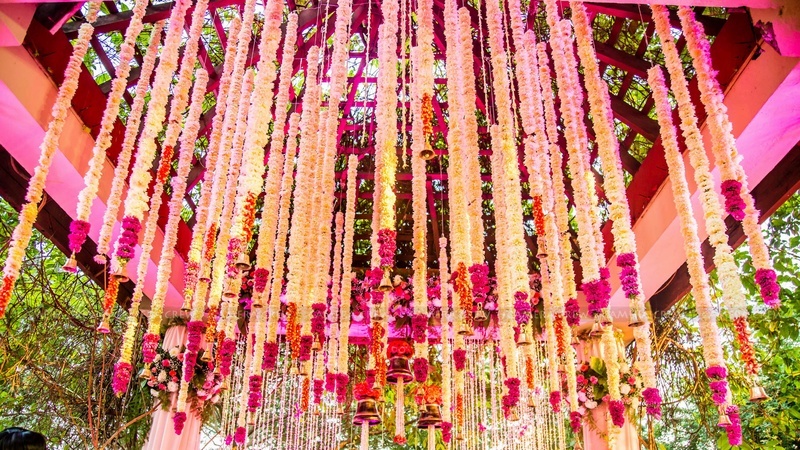 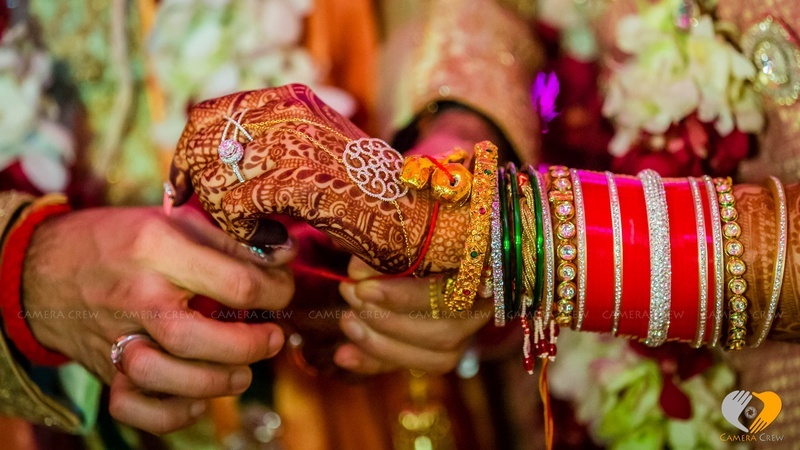 The stunning mandap décor was done with strings of marigold with Rose petals and bell ends. 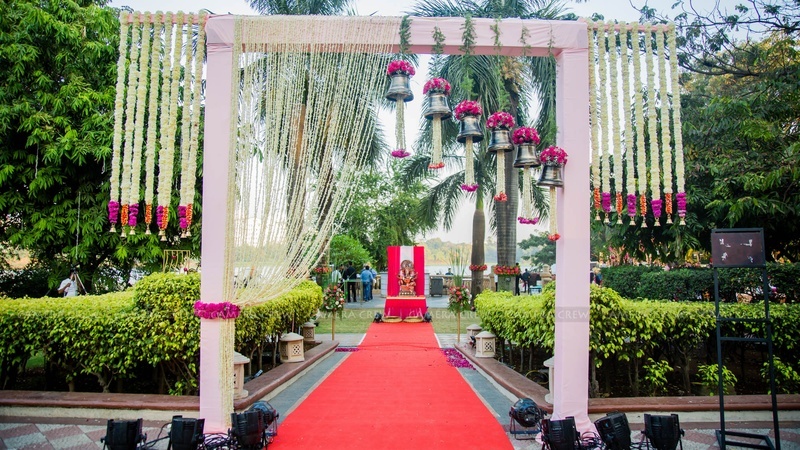 The entrance too was decorated with strings of white Marigold strings swept aside, draped like a curtain on one side and silver bells with ferns and purple flowers – looking absolutely beautiful. 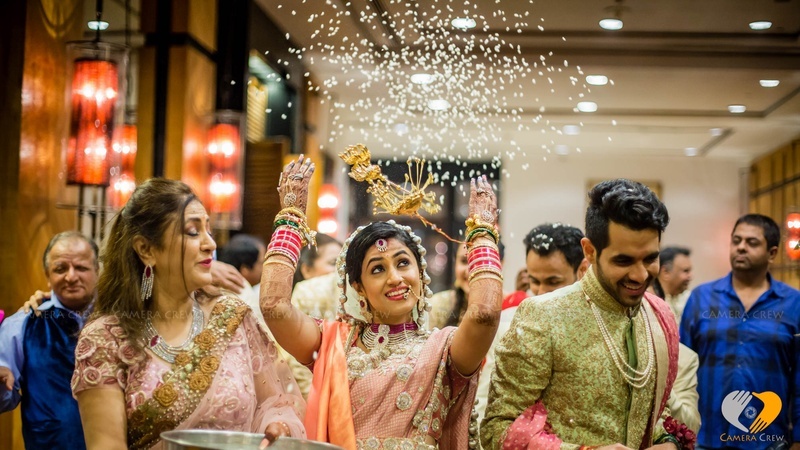 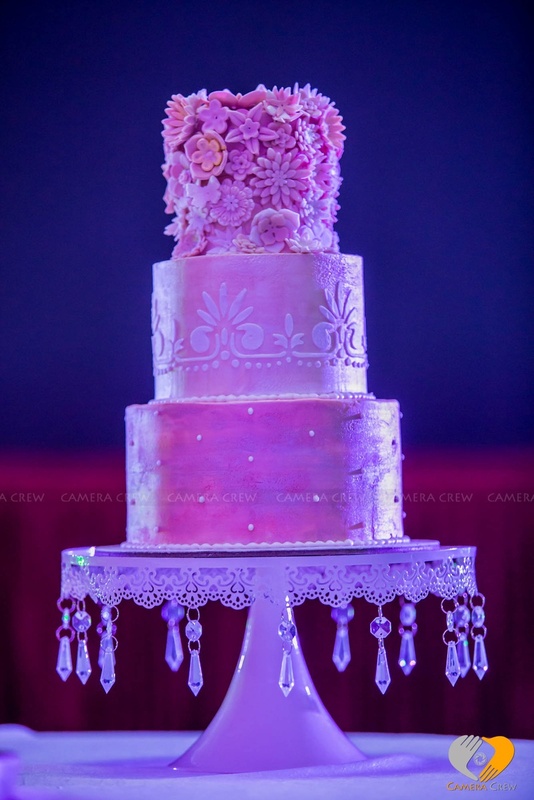 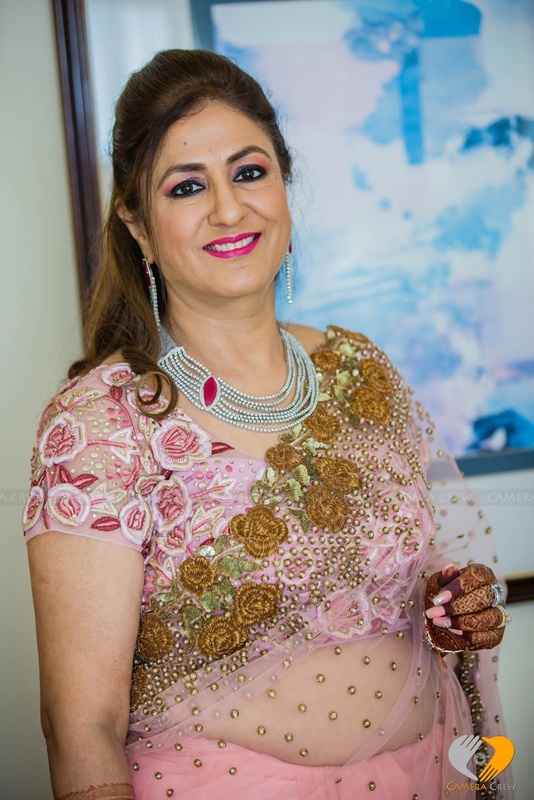 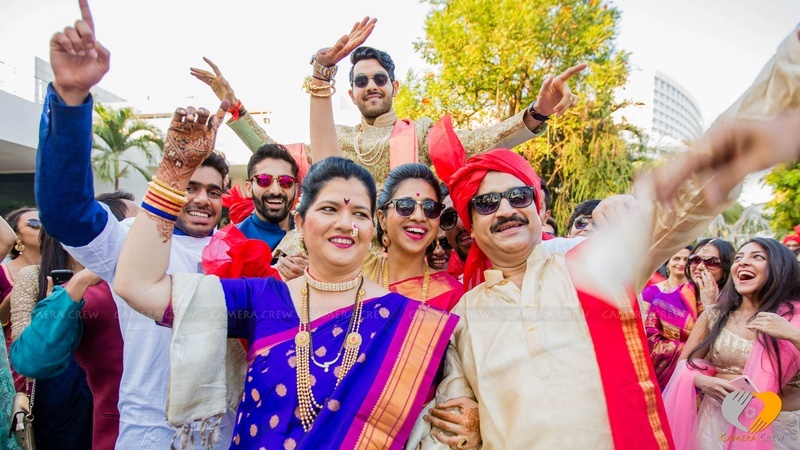 What to look out for as you scroll through this wedding album – the stunning mother-of-the-bride, the three-tiered metallic iced cake, and those amazing drone shots of the entire baarat! 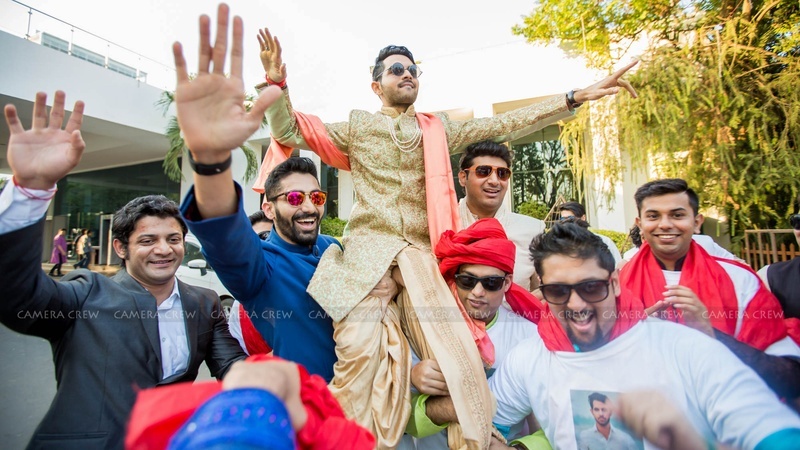 "Cause Everybody was Kung-fu Fighting"